Welcome to the first official Weekly WHIM! In case you missed what this segment is all about, you can check out my last post here. This week’s WHIM is discipline. Something I’ve been working on is getting myself into a solid routine. Too often I allow so many internal and external forces sway my plans for the day. The minute that alarm blares my head spirals into, “I need to get up and read my bible and then go to the gym. Ugh, but I’m just so tired and the bed is so comfy. Maybe I’ll just sleep for ten more minutes…” Notice how our beds are at their most comfortable when we have to leave them? It’s a trap! The point is, I let these influence me so that when I finally do get up, I no longer have time to read or workout before other priorities present themselves. When a free space does enter my schedule later in the day, I’ve already had too much time to consider it and talk myself out of doing something useful with the time. I’ve kept this word in the forefront of my mind the past few weeks, each morning wielding it as a weapon against laziness. Just saying the word in my mind brings up so much imagery for me. Discipline-an olympic athlete getting up before the sun to practice their craft. Discipline-a student at a desk late into the night studying for an exam. Discipline-a mother getting up for the sixth time to quiet a crying baby. Discipline-a preacher praying for God to speak through him another week. Discipline-a child riding a bicycle with scratches up her arm. Discipline-a husband working overtime to provide for his family. Discipline. Discipline. Discipline. By meditating on that word so often, the word itself has begun to evoke so many emotions, hopes, and dreams within me. Those aspirations are such a powerful weapon against laziness. It has been the biggest influence to get me out of bed most mornings. The second that inevitable debate begins in my mind, I just start playing “discipline” on repeat so much that before I even know it, my half-conscious-self is already out of the bedroom. Yes, I battle laziness every day, but I want to do great things with my life. I want to have an impact through God’s calling. The only way to succeed in anything you are trying to do is to be disciplined through it. Do you want to know God better? Be disciplined in reading your bible. Do you want to get in shape? De disciplined in going to the gym. Do you want to write that book? Be disciplined and get those words down. Every. Single. Day. I’ll leave you with this video. Our church put this together for a recent sermon series called “The Power of Same.” This video is a spoken word by our pastor that I find deeply motivating. I have an audio copy from iTunes that I have shuffling into my playlist at the gym. I hope it inspires you to be disciplined and fight the good fight against laziness! How do you battle laziness? Is there a certain routine that works best for you? 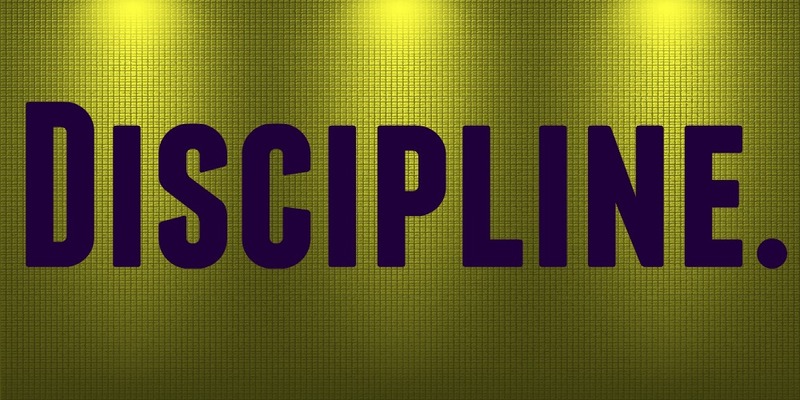 What does discipline look like in your life?